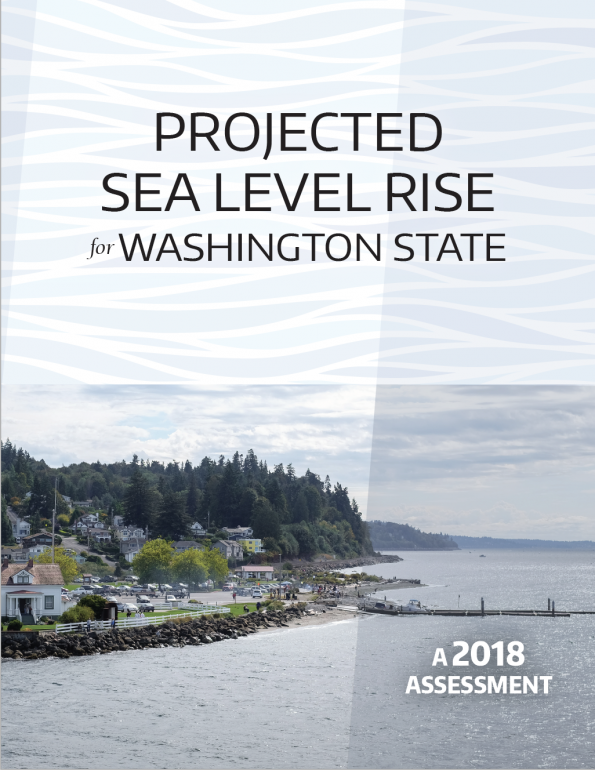 This report provides an updated set of absolute and relative sea level rise projections out to 2150 for Washington State. These probabilistic projections incorporate the latest climate science, are available for 171 locations across Washington State, and are designed for direct application to risk management and planning. These new projections incorporate the latest sea level rise science and account for the geographic variability in the vertical movement of the land surface. Therefore, this new assessment of sea level rise for Washington State is an improvement over previous assessments. Comparing the projections for 2100, the central estimate of these new projections (1.6-2.0 ft) is lower than the central estimate from the last regional report on sea level rise (2.3 ft; NRC, 2012). Previous studies did not include an estimate of likelihoods, but the high end from the NRC (2012) report (4.5 ft) is much lower than in the new projections (7.2-8.3 ft), and instead corresponds to about the 1% probability of exceedance in our current study (4.1-4.8 ft). A more in-depth review of the science, including comparisons with previous work, can be found in Appendix B of the report (see below). We recommend using these new projections for coastal impacts assessments within the state of Washington.This work was produced as part of the Washington Coastal Resilience Project (see below). Our relative sea level rise projections reflect these distributed estimates of vertical land motion, showing higher sea level rise in some places than in others. Although the rate of vertical land movement is generally small compared to absolute sea level rise projections – especially later in the 21st century – it can have a noticeable impact on observed and projected sea level in some locations. For more information on these sea level rise projections and for extensive documentation on projection methodology, please download the project report and associated appendices listed below. These materials are also available online on the Washington Coastal Resilience Project ‘Data and Resources’ page. Please contact Harriet Morgan (hmorg@uw.edu) or Guillaume Mauger (gmauger@uw.edu) with any questions about this project. The Sea Level Rise in Washington State – A 2018 Assessment report was a jointly-led effort by the Climate Impacts Group and Washington Sea Grant, in collaboration with the University of Oregon, University of Washington Earth and Space Sciences and the United States Geological Survey. This work is part of the Washington Coastal Resilience Project (WCRP), a three-year effort to rapidly increase the state’s capacity to prepare for coastal hazards, such as flooding and erosion, that are related to sea level rise. The overall aim of this collaborative project is to improve risk projections, provide better guidance for land use planners and strengthen capital investment programs for coastal restoration and infrastructure. The project is primarily funded by a grant from the NOAA Regional Coastal Resilience Grants Program (grant #NA16NOS4730015). Additional funds were provided by the State of Washington as well as the Pacific Northwest Climate Impacts Research Consortium (CIRC), which is partially funded by the Regional Integrated Sciences and Assessments program under NOAA grant #NA15OAR4310145.